As previously discussed, I think the best thing about the blogging community is finding out new things. Whether its how to make a cronut, a life saving tip for peeling chestnuts or like today just learning about an unfamiliar product. Today I’m going to talk about milk fed lamb. You may never have heard of it. I hadn’t until a few years back when we had it at Oustau de Baumaniere. The most incredible hotel in the heart of Provence. It’s actually quite reasonably priced to stay there. The food though, is as expensive as a night in the top suite almost. After some research we found that milk fed lamb is just a very young lamb that is only fed on it’s mothers milk. Usually about 35 days old. We shared a leg, just enough for two, and it was served with an aubergine parmigiana. I’ve been looking to buy the lamb ever since. It’s a Pyrenean speciality. The Spanish food specialist I now use, Basco Fine Foods, luckily came up trumps and had some shoulders in. If you ignore the price of it. I have to say it is a real delicacy. 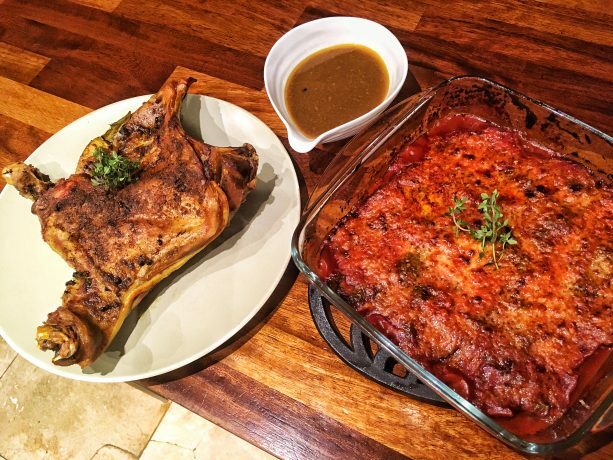 The flavour of the meat is not as meaty as lamb, just sweeter. It is so succulent too. Practically the entire thing, bar the bones, is meltingly tender and delicious. It only had a very short life, but you feel you’ve done it justice and admired its beauty as you eat it. You now have to play the guessing game and decide which one is worthy of two michelin stars!! Parmigiana, is basically an aubergine lasagne. Aubergines are griddled and layered up with a basic tomato sauce and parmesan. Hey presto, couldn’t be simpler. Brown the lamb first, in a pan if it will fit or under the grill. Add to a large roasting tray. Rub in ras-el-hanout, add the stock and cover the tray with foil. Roast for 2 hours at 120°Cfan. Remove foil and a cup full of cooking liquor. Place back in the oven. After a further hour, remove another cup of cooking liquor. The meat will be ready after 4 hours cooking total time. Reduce the cooking liquor to make a wonderful jus. Heat the passata up with the garlic cloves until they cooked. Add the vinegar and add small amounts of sugar until you can no longer taste the vinegar.Season with pepper and add the basil. Slice the aubergines lengthways, careful, about 5mm thick. Salt them and leave for 10 minutes. Dab the moisture away with kitchen paper, turn over and salt again. After 10minutes dry again. Brush with oil and griddle for 3 minutes a side until soft. Layer up in a large pyrex dish. Mine is 9″x9″. Start with one layer on the bottom. Add 4-5 tablespoons of tomato sauce, a sprinkle of cheese and then another layer of aubergine. Repeat until everything is used up. The sauce in between layers is there to sandwich the aubergines together. They shouldn’t be swimming in it. Finish with a good dusting of parmesan, add a splash of truffle oil if you have any and bake at 180°C for 30-40minutes. I can imagine how delicious the milk-fed lamb is and I would love to try it one day. I love Parmigiana and I love the addition of truffle oil. Great meal. I haven’t seen it available but I’m definitely talking to my butcher this week. This sounds SO good! Make sure you’re really nice to him. I would think they’d be some milk fed NZ lamb kicking about. I can just imagine how tender and succulent the lamb must be. I did a nice job of recreating the dish you had and I’m sure the cost was much less. Nice one, Karen. Pleased I’ve inspired you. Did you make the parmigiana? 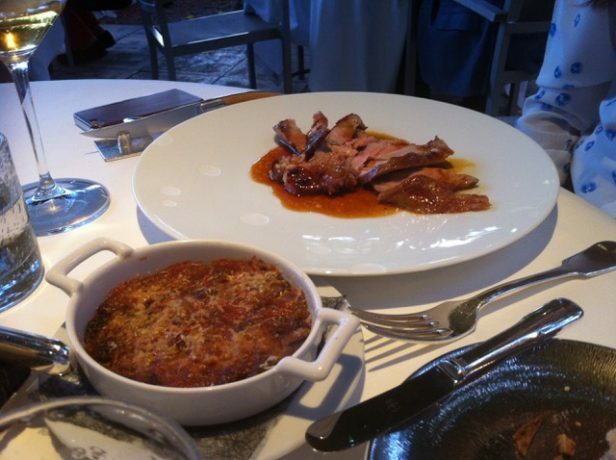 I appreciate very much the pairing “Lamb – Parmigiana”, combining two different aromas ! Hi Brian, thanks for stopping by. Love your blog! Wonderful dish Dave! What stock do you use? Is it homemade? As you’re sauce always look so wonderful. Hi Amanda, thank you. It actually doesn’t matter too much. It’s just for moisture. Lamb stock is ideal, homemade even better. In all honesty, I’d just use the low sodium chicken ones you can get.